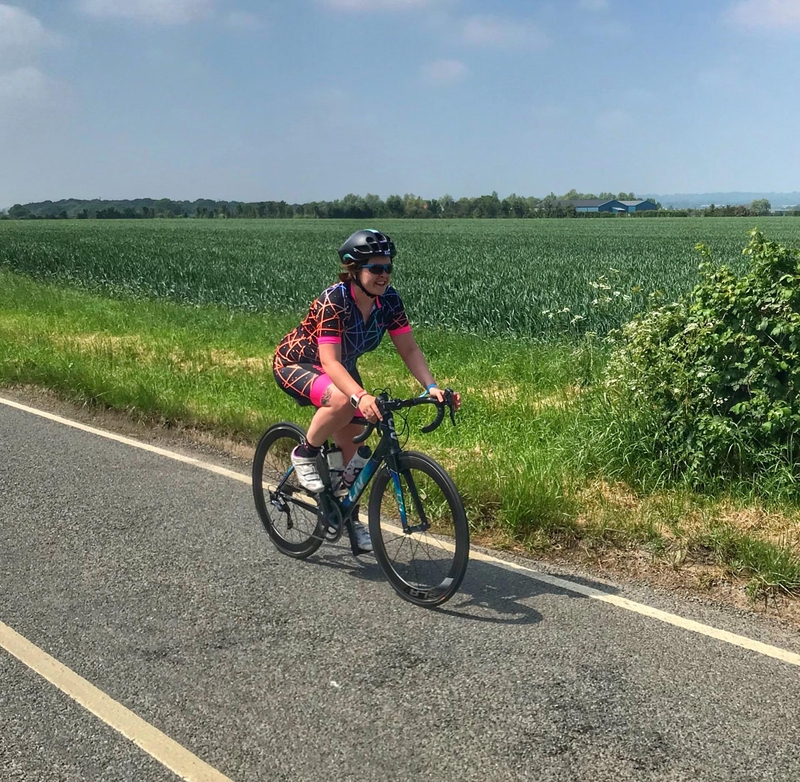 I’ve never visited Cardiff before, so when Always Aim High Events offered me a place in the inaugural Cardiff Triathlon, I jumped at the chance for a weekend away in a new city. The race fitted nicely into my calendar as my second Olympic distance triathlon and I planned to aim for a PB in the Welsh capital. Glen and I drove to Wales on the day before the race and arrived in glorious sunshine. We explored the city and wandered down to the Millennium Centre to register and collect my race pack. I looked out at waterside and felt excited at being among the first to (legally) swim in Cardiff Bay the following morning. The day of the race didn’t start smoothly- our car had been locked into the hotel carpark with my bike inside! The hotel owners had promised to leave it open, so we were frustrated to find it locked at 6am. I had visions of having a DNS after travelling all the way to Cardiff! After giving them a rude awakening, the gates were unlocked and we were finally on our way. The sunshine had turned into torrential rain overnight and it was set to continue throughout the day. Glen wrapped up in waterproofs and got ready for a long morning supporting me on the course. The race organisers had given spectators cattle-bells to ring, which was a nice idea! Jumping into Cardiff Bay from the pontoon, I was surprised at how warm the water was. We had been told it was 18.2 degrees and it certainly felt it! I had been concerned that the water would be choppy, but it was actually very calm and pleasant to swim in. There were a few weeds floating around as we waited for the off, but it was clear as we started to swim. The course was one rectangular lap taking us out into the bay, then we turned at the buoys and headed back into shore with the current behind us. As I swam back towards the shore, I kept the red brick outline of the Pierhead Building in my eyeline through my misty goggles. I saw one woman swimming back-stroke in completely the wrong direction- I hope the marshalls caught her before she got too far! 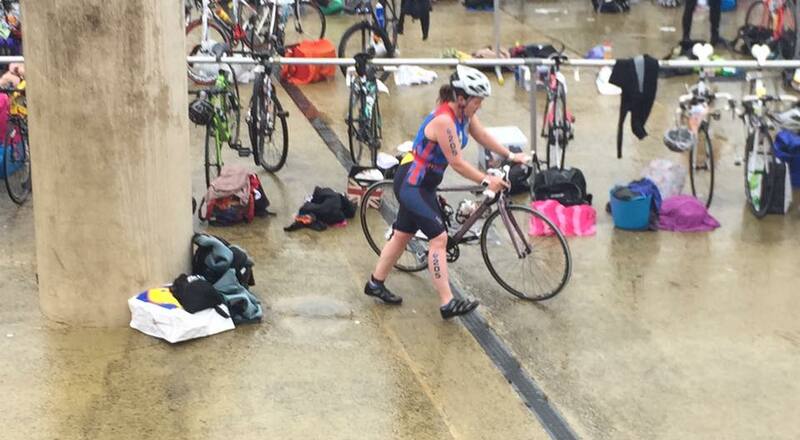 As I climbed out of the water and ran back towards transition, I saw a personal best time on my Garmin. The current must have really helped! I was chuffed to achieve a sub-30 minute 1500m swim. A large plaza known as Roald Dahl Plass was used as the transition area. The stone pillars served as markers, so it was easy to find my bike- I knew I was racked by the first of the pillars on the left. 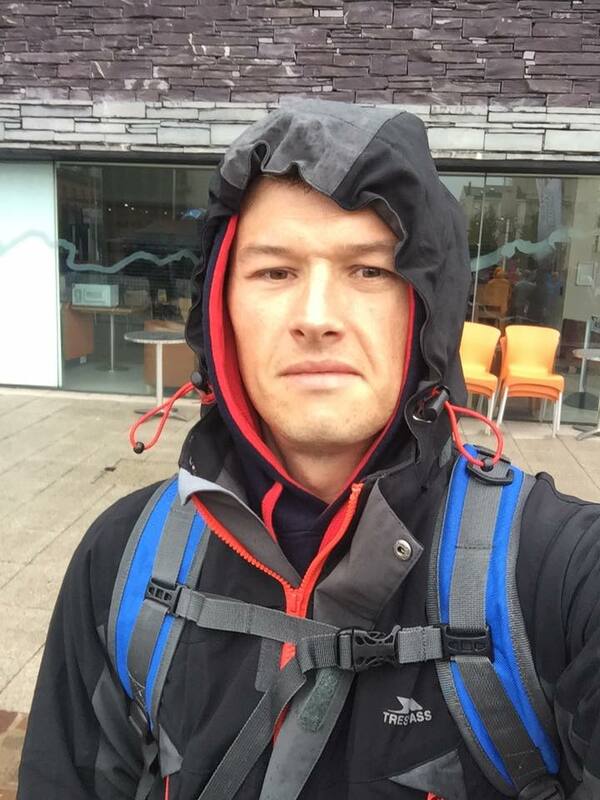 There was no point in drying off my feet- my kit was absolutely drenched in the rain! Heading out onto the cycle course, the rain was hammering down heavily making the roads slick and slippery. The course took us through a residential area and retail park- not the most scenic of routes, but as a city centre triathlon this was to be expected. With completely closed roads and a flat course, this had the potential for a fast ride. After seeing so many crashes on the wet roads at Hyde Park, I’ve lost some confidence on the bike. I decided to ride slowly keeping my speed around 16mph, I stayed to the left letting faster cyclists pass me. I did see a few accidents out on the course, but it wasn’t quite as bad as I expected. I do love a Welsh accent, so it was great to hear so many local participants encouraging me on the bike course! The live tracker was updating my bike splits to my Twitter and Facebook accounts, so my tri club friends could see how I was getting on. Back to my area by the first stone pillar and a quick change of kit. The woman next to me was panicking that she had missed a lap on the bike course- I felt for her as I know how nerve-wracking that can be! The run was two 5km out-and-back loops taking us along the bay onto a narrow strip of land which separates the bay from the sea. Like the cycle route, the run was completely flat and fast. The rain still hadn’t subsided, my trainers squelched with every step and water dripped off my visor. I looked forward to finishing so I could get warm and dry! The course looped in front of the Millenium Centre, before heading back out around the bay. It was buzzing with spectators and supporters despite the rain. My first lap complete and I saw Glen for a quick high-five! The second lap felt a little tough… I distracted myself by looking at the kits of the other runners and counting how many clubs I could spot. I saw several people from a club named Crap Tri, which kept me amused! I hoped to PB on the run, but the course seemed to be a bit short- my Garmin shows it as only 5.8 miles. If it is an accurate 10km course, then my time of 54:51 is a huge PB! At the finish line, a table offering sweets, biscuits and fruit was set-up. I queued to grab as many orange segments as possible- they were so refreshing after the run! We were given a slate coaster as a memento of the Cardiff Triathlon, I must admit I was a little disappointed not to receive a medal for my efforts! Although it is actually nice to get something a little different as a keepsake from a race. Always Aim High Events organise the Slateman Triathlon in Snowdonia, so I believe that is where the Welsh slate theme comes from. My finishing time was 2:58:22. I was two minutes slower than my previous Olympic distance at Hyde Park, but the course in Cardiff is 3.5km longer so I’m happy with that! 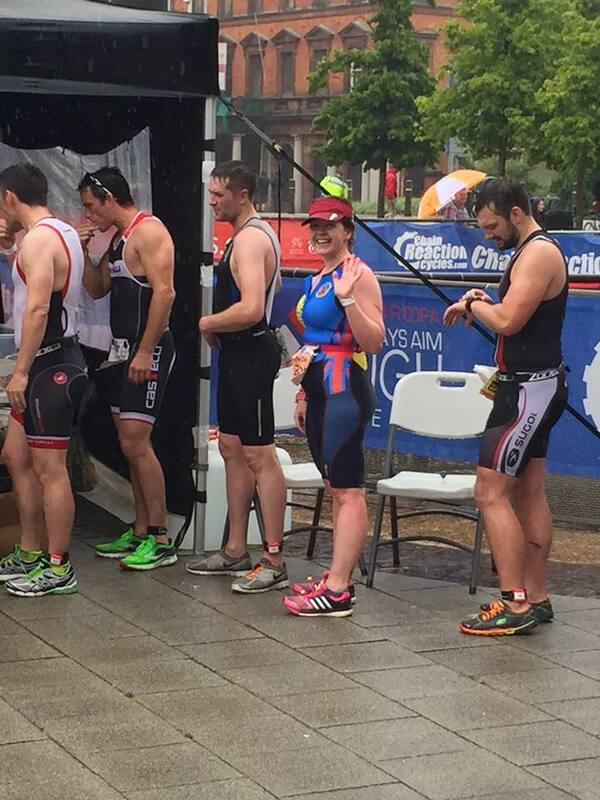 Overall, the first Cardiff Triathlon was a great success despite the awful weather. It’s always fun to race in a new location and the Welsh hospitality made for a great atmosphere. Thank you to Always Aim High for the entry.